While those are things that people did want in the past, the world has also changed substantially. As technology has evolved, the experience of Walmart customers has also moved from physical to digital. That has made Walmart adjust its core value proposition, and it also made it adapt its business model. 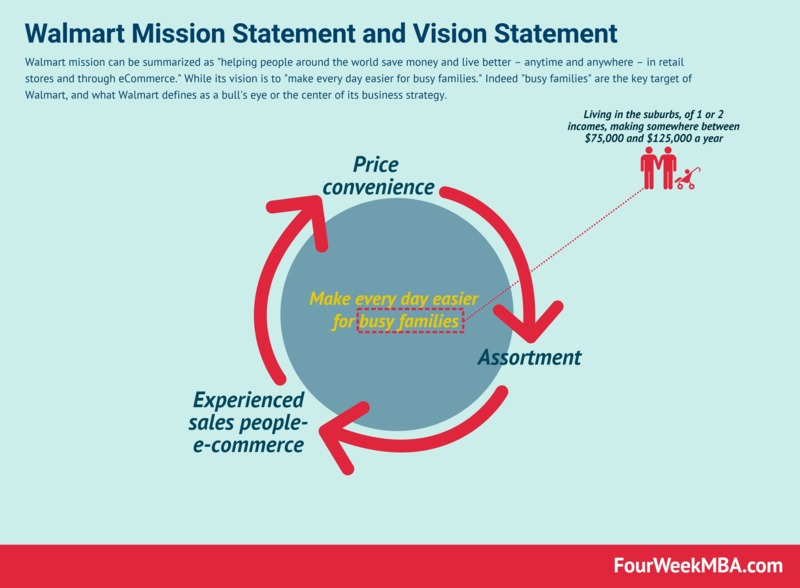 At the core, as we’ll see in this analysis, the three elements (price, assortment, and experience) remain three critical values of Walmart mission statement. Walmart Inc. helps people around the world save money and live better – anytime and anywhere – in retail stores and through eCommerce. Therefore, Walmart mission informs its business strategy and how also this has changed over the years. For instance, while the core of the Walmart business model has stayed the same, its strategy has adapted to new technologies. E-commerce was not a core part of the Walmart business strategy. Currently, instead, Walmart has incorporated this part within its mission. 90% of Americans live within 10 miles of a Walmart. There’s 1.4 million associates, and Walmart‘s the largest grocer in the U.S. So when we think about some of these assets and we think about playing offense, we think about it across 3 dimensions: price, assortment and experience. Let’s see more in details Walmart vision statement and why that matters. What is the direction? We want to be the destination for customers to save money no matter how they want to shop, whether it be pickup, delivery in 2 days or deliver in 2 hours. The idea is to save customers money at any service level. In summary, the strategy is very simple. We’re going to be maniacally focused on just nailing the fundamentals. We’re going to look for ways to play offense by leveraging unique assets. And we’re going to be focused on innovating for the future. So let’s talk about making every day easier for busy families. Why busy families? Well, it’s a big part of the market, and we’ve learned that what we do to effectively serve them helps us serve everybody else, so they’re the center of the bull’s eye. Choosing a market that is big enough is a fundamental problem in the entrepreneurial world. That is why often investors demand startups to have a clear understanding of their TAM or total addressable market. To clarify, this isn’t a simple issue. When companies are opening up new spaces, and new markets, none knows for sure how big that market will be. For instance, when smartphones took over, it has become a massive market, and many companies have already moved to a mobile-first world. Walmart picked the “busy families” because according to them, it represents a good chunk of the families. That makes them focus on a precise segment and informs its business strategy. This focus allows a better and more effective execution. It also creates a flywheel or virtuous cycle. As Walmart points out, they learned that by serving a specific segment, they end up serving anyone else better. So we really have 1 member. And I want you to think of them like this. It’s a busy family, typically living in the suburbs of 1 or 2 incomes. They make somewhere between $75,000 and $125,000 a year. They may own a couple of cars. They may be employed or self-employed. They may own a small restaurant or run a small office and purchase a few things for their business. Walmart has a clear idea of its key market segment. So we’re moving forward and we’re moving quickly to align the entire business around this more narrow focus. We’re evaluating everything from our membership offering to our merchandise categories to our locations, and we’ve got some important choices to make in the future. And what’s going on with those busy families according to Walmart? What’s happening with them? Well, you know they’re more connected. They’ve embraced mobile in a big way. In fact, globally, around the world, mobile commerce has grown by about 80% just in 2 years. Technology will also help serve up things to customers that they might want to do. So becoming more of a digital company and learning how to work with speed is important to us throughout. As Walmart business model adapts to the future technology landscape, it also adapts its value proposition! This is critical as a business model is the fruit of a long-term vision and a shorter term mission. And as a business strategy changes and adapts, the fundamentals of a business model (its value proposition) also adapt and change. This is eventually reflected in the financials. It is important to remark that technology helps an organization to better serve its target. This also implies a change in its monetization strategy. However, its core values stay the same. For instance, in 2018, Walmart started to roll out a program called Jetblack, with the aim of serving “busy families” that for a fixed membership price could get a customized sales experience.